Pravin Jamnadas Gordhan was born in Durban, Natal (now KwaZulu-Natal), South Africa on 12 April 1949. He matriculated from Sastri College, Durban in 1967. In 1973 he graduated from the University of Durban-Westville (now University of KwaZulu-Natal) with a Bachelor of Pharmacy degree. He completed a DTech degree in Business Administration at the Free State Central University of Technology in 2009 and received an Honorary Doctorate of Commerce from UNISA and an Honorary Doctorate of Law from UCT in 2007 respectively. In 1971 Gordhan joined the Natal Indian Congress (NIC) and was elected to its executive council in 1974.He organised and led the student movement and civic structures during the 1970s and 1980s and participated in the NIC’s call to boycott the then government’s Tricameral Parliament elections in the 1980s. During the 1970s, Gordhan helped establish grassroots community organisations, became involved in underground activities of the African National Congress (ANC) and the South African Communist Party (SACP). He was previously a member of the SACP’s Central Committee. In 1974 he completed his pharmacy internship at King Edward VIII Hospital in Durban. He worked there until 1981 when the then Natal Provincial Administration dismissed him for his political activities while he was in detention. He was released from jail in 1982 and received banning orders effective until June 1983. Gordhan was involved in the launch of the United Democratic Front (UDF) in Cape Town 1983 of which the NIC was an affiliated organisation. Gordhan worked as a volunteer for the NIC's anti-tricameral parliament campaign in 1984 and was arrested with other leaders of the NIC a week before the elections. He was detained in Durban in 1985 in terms of Section 29 of the Internal Security Act. In 1986 he was forced to go underground and remained in hiding until his arrest in 1990, when he was named as a key figure in the ANC underground network, Operation Vula. In 1991, he was granted indemnity. He was detained three times by the apartheid government and spent four years in the underground structures of Umkhonto weSizwe (MK). Gordhan attended the preparatory meeting for the Convention of a Democratic South Africa (CODESA) in 1991 as a joint NIC/Transvaal Indian Congress (TIC) representative, and was appointed NIC/TIC delegate to the steering committee responsible for organising Codesa 1, which became the management committee after CODESA 1. In 1993 he was appointed to the panel of chairpersons on the planning committee of the multi-party negotiation process. He was Co-chairperson of the Transitional Executive Council (1991 – 1994), which prepared the country for the 1994 elections. Gordhan became a Member of Parliament for the ANC in 1994 until 1998. He played a pivotal role in drafting the White Paper on Local Government which laid the foundation for developing local government authorities. He was the Chairperson of the Constitutional Committee of the Constituent Assembly from 1996, which has oversight over the implementation of South Africa’s new constitution, adopted in 1996 and was elected to the SACP's Central Committee. Gordhan served as South Africa’s Deputy Commissioner for the South African Revenue Service (SARS) from March 1998 and as Commissioner for SARS from November 1999. 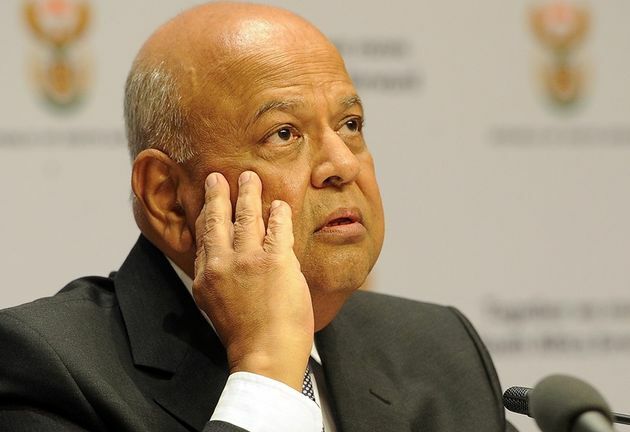 He was appointed Minister of Finance on 11 May 2009.Gordhan was the Chairperson of the World Customs Organization (WCO) until July 2006 and is the Chairperson of the Forum on Tax Administration (FTA) within the Organisation for Economic Cooperation and Development (OECD) from 2008. On 10 May 2009, in the midst of the global financial crisis and a world-wide recession, President Jacob Zuma appointed him as Minister of Finance, succeeding previous minister Trevor Manuel. He was faced with the difficult task to navigate the domestic economy out of turbulence towards fiscal stability and a new growth path. On 25 May 2014, he was replaced by Nhlanhla Nene as Minister of Finance. In 2014, Gordhan was appointed Minister of Cooperative Governance and Traditional Affairs, succeeding Lechesa Tsenoli who became Deputy Speaker of the National Assembly of South Africa. In May 2009 in the midst of the global financial crisis and a world-wide recession, he was appointed as Minister of Finance and had the difficult task to navigate the domestic economy out of turbulence towards fiscal stability and a new growth path. In May 2014, he was appointed as Minister of Cooperative Governance and Traditional Affairs only to be re-appointed to the Finance portfolio in December 2015. He remained the Minister of Finance until former President Zuma inexplicably recalled him at around midnight on 30 March 2017. He returned to the Legislature as a Member of Parliament and became part of the Portfolio Committee on Public Enterprises. He continues to serve as member of the National Executive Committee (NEC) of the African National Congress, having been elected as a NEC member in December 2012. Former President Jacob Zuma, a key supporter of the Libyan leader Muammar Gaddafi, opposed Nato's military intervention in Libya during the rebel uprising in 2011. Then United States of America’s Secretary of State, Hillary Clinton, was told that President Zuma secretly received money from Gaddafi, the Mail & Guardian reported. President Zuma visited Gaddafi in 2011, and according to a Sunday Times report, that’s when Gaddafi arranged with the former South African president to move money out of the country. In 2014, the Sunday Independent reported that apartheid-era Special Forces were reportedly used to bring the assets to South Africa, and that the assets were initially stored in Gauteng. These assets were reportedly never recovered and were separate from the R10 billion that former minister of finance Pravin Gordhan handed back to Libya in 2013. That money was recouped from South African’s accounts of the Libya Investment Authority, the Libya Africa Investment Portfolio and the Libya Africa Investment Company – which were all linked to Gaddafi. In December 2015, President Jacob Zuma axed Minister of Finance Nhlanhla Nene, replacing him with David van Rooyen (who was minister for four days), who in turn was replaced by Gordhan after the finance markets reacted negatively causing South Africa to lose billions of rands and the State-owned investment group the Public Investment Corporation (PIC) to lose nearly R100 billion within 48 hours. On the eve of the 2016 Budget Speech, that was to be tabled on the 24th February 2016, a list of 27 questions from the Hawks was sent to Gordhan. In total there were 27 questions around the alleged "rogue unit" at South African Revenue Service. Gordhan was the SARS commissioner in 2007, when the so-called rogue unit was set up. He has maintained that it was above board and had ministerial approval. Gordhan was baffled by the questions, saying, "Once again, the Hawks and those who instruct them have no regard for the economic and social welfare of millions." He then sent a letter to the Hawks through his department that he would be unable to meet the deadline imposed. The letter from his office stated that "he will respond in due course, once he has properly examined the questions and ascertained what information, of the information you request, he is able to provide." He also wanted to know on what authority the Hawks were asking these questions of him. On 30 March 2016, he replied to the questions put to him by the Hawks. Gordhan was quoted as saying, “I believe this was meant to intimidate and distract us from the work we had to do in preparing the 2016 Budget. "By September 2016 Gordhan had made public all correspondence between the Hawks and his attorneys, in which the unit said he was not a suspect and had nothing to fear. On 11 October 2016, summons were issued against Gordhan related to alleged charges of fraud committed while he was still Commissioner of SARS. These alleged charges relate the establishment of a so-called rogue unit when he was SA Revenue Service commissioner as well as for his alleged role in the reappointment of Ivan Pillay at SARS after he had taken early retirement. Gordhan was expected to appear in court together with two former SARS senior executives - Ivan Pillay and Oupa Magashula – on charges of fraud on 2 November 2016. In 2018, following charges laid by Public Enterprises Minister Gordhan against the Economic Freedom Front (EFF) on Monday, the party hit back, announcing that they will lay charges, including corruption and money laundering, against the minister. Alex Mitchley (2018). EFF hits back at Gordhan with charges of their own News24, 26 November 2018. Available at https://www.news24.com/SouthAfrica/News/eff-hits-back-at-gordhan-with-charges-of-their-own-20181126 online. Accessed 10 April 2019.